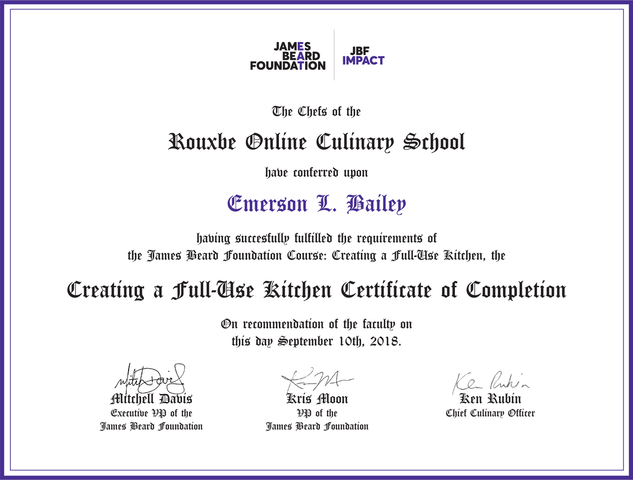 Welcome to Creating a Full-Use Kitchen, an online course by the James Beard Foundation - created with founding support from the Rockefeller Foundation, served up by Morton's Salt®, with Food Waste Tracking Partner LeanPath - and designed to introduce food waste reduction methods into the culinary school classroom. This course is intended to complement your existing curriculum by providing information on the history of food waste and creative approaches for combatting it. Your Certificate of Achievement Awaits You! Designed and taught by leading chef educators, this program delivers detailed video instruction in the foundations of cooking. Certification through Rouxbe is a mark of achievement and an important part of showing your commitment to a professional path. 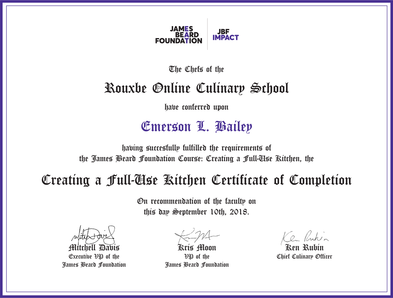 "Your program adds depth and great value to the precepts of quality culinary education, and we are excited to be able to promote your achievements." You will earn 15 CEHs from the ACF (American Culinary Federation) upon successful completion of this course.